For this week’s fabulous video blog I have for you a fabulous feature on pinup winter fashion. Winter is a beautiful time full of hot chocolate, and everything around us becoming beautiful and green, with the seasons changing our wardrobe makes many changes too. I’ll be talking all about tips for keeping warm in water, winter essentials and extravagant extras! If you have your own winter tips please do let me know in the comments below! As always if you loved today’s video be sure to hit the subscribe button on my YouTube Channel to stay up to date with all my vintage fun! 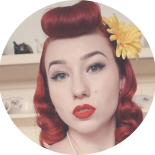 This entry was posted on June 28, 2018 by Miss Lady Lace in Pinup Life, Videos, YouTube and tagged 1940's, 1950's, blogger, glamour, miss lady lace, miss lady laces pinup blog, perth, perth pinup, perth pinup blog, perth pinup community, pin up, pinup, pinup blog, pinup blogger, pinup fashion, pinup girl, pinup life, pinup lifestyle, pinup perth, red lips, retro blog, retro girl, retro glamour, the perth pinup community, victory rolls, vintage, vintage blog, vintage blogger, vintage fashion, vintage girl, vintage glamour, vintage perth, vintage pinup blog, vintage winter fashion.